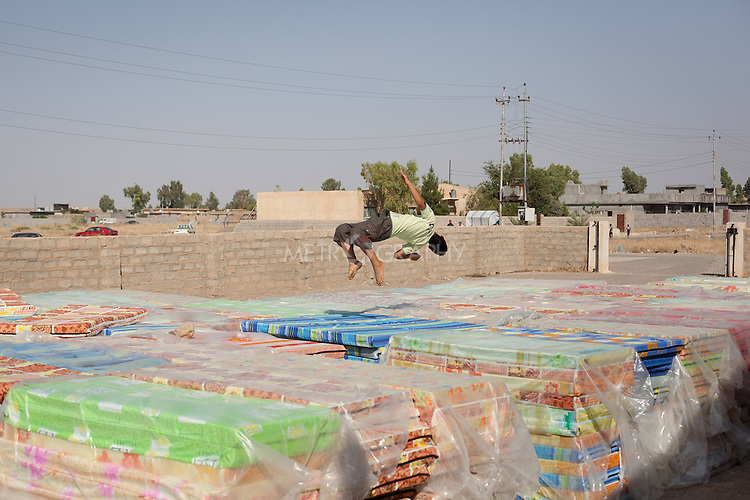 18-06-2014 -- Bahary Taza Village, Khanaqin, Iraqi Kurdistan -- An Iraqi refugee boy jumps on mattresses, stacked in preparation for the arrival of more refugees at a makeshift refugee camp set up on the outside of Bahary Taza Village in Iraqi-Kurdistan. According to local sources, over the last week more than 400 families have arrived to a village in the Kanaqin area, South East of Kurdistan at the border with Iraq, following increasing violence in the region. The IDPs, who have arrived from Jalula, Shayabana and other cities in Diyala region, have been assisted by the local population. The United Nations on Wednesday upgraded Iraq’s latest crisis to a level 3 humanitarian disaster — its most severe designation — as U.N. officials said they were scrambling to provide water and other essentials while preparing to cope with an estimated 1.5 million displaced people.